One of Alexandria’s most popular restaurants has finally hit the capital. Country Hills has been driving people insane with its delicious American comfort food and signature deep-dish pizzas, and Cairenes can now enjoy its guilty pleasures without having to go all the way to Alexandria. Country Hills takes its place in Majarrah, one of Sheikh Zayed’s newest malls, right after Hyper One Market and before Capital Business Park. Majarrah is beautifully decorated with cheerful colours and lights that glow ever more beautifully in the night. Its name translates to Galaxy, and each part is named after a planet in our galaxy. Aside from regular restaurants, they have food trucks, or rather a food train, where each carriage has a different restaurant. There will also be a cinema opening soon in this mall. As for the start of this article, Country Hills, the American Diner also has another branch in Heliopolis, aside from its two branches in Alexandria. Their huge menu has tons of salads, appetisers, sandwiches, pizzas, as well as an assortment of mac n cheese choices. 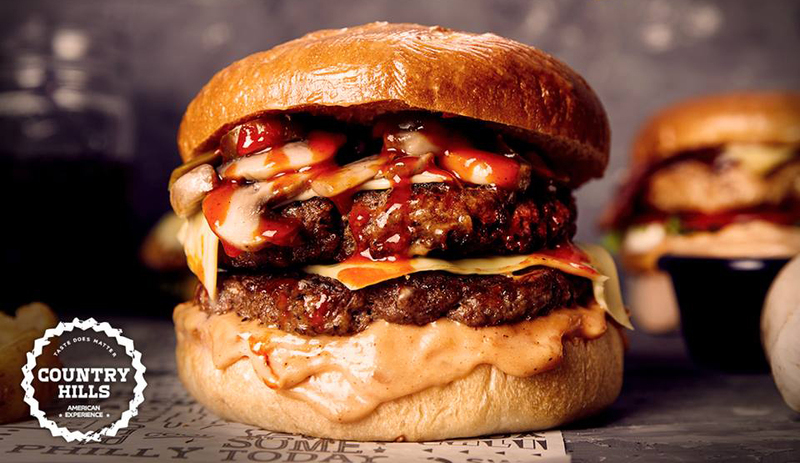 We opted for the Cowboy Burger (79 EGP) which comes topped with smoked beef bacon, mushroom, caramelised onions, BBQ sauce, and smoked cheese sauce. You can also ask for any of your burgers to come as double-patties, but we decided on just the one. Additionally, we picked the Pizza Burger (73 EGP), where the top bun is treated like pizza dough and topped with pizza sauce, cheese, and pepperoni. To add a different flavour to our meal, we ordered the Western Salad (55 EGP), which comes as fried chicken strips, mixed with tortilla chips, sweet corn, red beans, tomatoes, lettuce, carrots, onions, jalapenos, and topped with ranch dressing. It didn’t take them long to serve our meal, and the table setup included plastic gloves to protect us from the messiness of the burgers. Their overall service was very friendly and prompt. The Cowboy Burger was very tasty, and it was rich in ingredients which were very well-balanced. As for the Pizza Burger, it was good, and the pizza sauce tasted great with the cheese, but the dough overpowered the whole sandwich; perhaps it would be better with two patties. Finally, the Western Salad gave us a crunchy flavour on the side, with a mesmerising mix of flavours from the rest of the ingredients. Overall, our experience was perfectly balanced between a great atmosphere, excellent service, and delicious food. We’ll definitely be looking to try out the rest of their menu soon. Country Hills also have an exciting breakfast menu. The Cowboy Burger and Western Salad. The overpowering bread taste in the Pizza Burger.